Every day, radiologists and other medical professionals peer deep inside the human body thanks to the sharp, detailed images produced by today’s IT-based medical imaging systems. 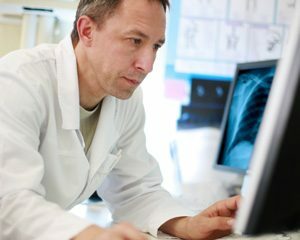 Picture Archiving and Communications Systems (PACS) have further revolutionized the diagnostic process by enabling teleradiology, where radiologists can read images over a network anywhere they have an Internet connection. Diagnostic workstations in the hospital setting are robust, stationary, and feature multiple monitors and specialized graphics cards to display data-rich images generated by CT or MRI equipment. But conventional notebooks are clearly inadequate when radiologists must perform diagnostic work from home, while traveling on business, or in the field during an emergency response. OEM manufacturers and service providers of medical imaging technology also feel the pain of inadequate computing power. Why demonstrate high-value software and services on a low-value consumer notebook? Now you don’t have to because NextComputing’s powerful and portable systems offer a better solution to today’s remote medical imaging challenges. Today’s healthcare providers are under constant pressure to cut costs yet maintain the quality of service delivery. NextComputing can help you achieve both objectives. Using our portable, high performance systems to power their high-resolution displays, radiologists can analyze sharp, detail-rich patient images and provide complete diagnostic readings from wherever there’s power and an Internet connection. Because they can work from home or remotely you can accelerate the delivery of care and lower cost overhead. Because NextComputing solutions are portable and powerful, they are ideal for demonstrating 3D imaging applications. Our true workstation-class computers are easy to set up, easy to transport, and make a strong first impression that can set you ahead of your competition. Training can be inconvenient and expensive for staff or customers if they have to travel to your training facility. And loading up and shipping a server to a training site and back can be a frustrating, time consuming and costly task. With NextComputing you have the option of bringing a powerful imaging server that is the size of a briefcase to customer sites for training events.